Bronze statue of Queen Elizabeth II with her horse stands on a platform at the front of the Queen Elizabeth II Gardens. The beautiful gardens display colorful flowers and a water fountain. Lush green trees surround the colorful garden. The Queen Elizabeth II Gardens are located at the Saskatchewan Legislative Building. 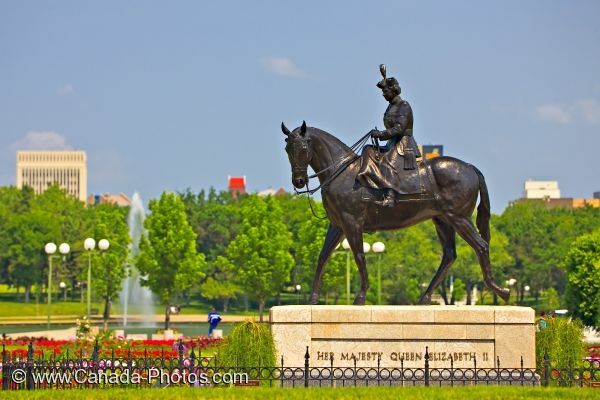 Equestrian statue of Queen Elizabeth II in the Queen Elizabeth II Gardens, City of Regina, Saskatchewan, Canada. Equestrian statue of Queen Elizabeth II in the beautiful Queen Elizabeth II Gardens in the city of Regina, Saskatchewan.